Assembling under a circular banner called Κψμβοσ, a growing number of niche performers gather in person and online to discuss techniques, videos, and all things cymbal. These extreme athletes can be found in many arenas from Drum Corps International to WGI Sport of the Arts. They share a common purpose: to be the best. Now they can find recognition—and possibly a bit of cash—in a scholarship just for them. There are several cymbal scholarships out there, but the Κψμβοσ (sometimes spelled Kymbos and pronounced kim-bose) scholarship is the only one exclusively for marching cymbal performers. The brainchild of co-creators Jack Borland and Chelsea Levine, who are Spirit of Atlanta instructional staff members, the scholarship is a charitable off-shoot of the Kymbos "club," whose motto "Different Methods, Same Madness" embraces all marching cymbals. With a jump in charitable donations this past year, the scholarship now offers several opportunities for both DCI and WGI members in year two. "We have come a very long way this past year," Borland explained. "After the initial success of the first Kymbos Scholarship last summer, we set our sights on expansion and began working to raise more funds so we could also offer a scholarship for the 2013 WGI season," Levine said. "We are very proud to say that we were able to realize that goal and awarded four scholarships of $150 in our inaugural season." The winners of the first WGI Kymbos scholarships were Rachel Adams (Rhythm X), Andrew Herschfelt (ASU Indoor Percussion), Joel Lopez (Infinity Percussion), Stephen Nelson (Palmetto Percussion). 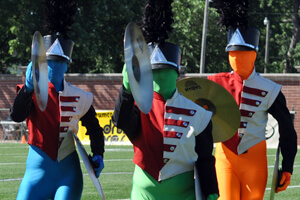 Four DCI corps members were awarded the scholarship in 2012. DCI scholarship recipients are recognized at the 2012 DCI Southeastern Championship in Atlanta. "We anticipate the total sum of the awards to exceed $1,500 in 2013, which is approximately a 25 percent jump from last season," Levine said. Like last year, funds were raised through the sale of a specialty glove that assists cymbal players during performances. So successful were the gloves, Kymbos is now able to also extend the scholarship to DCI corps members in Open Class corps. "We will be offering separate scholarships for World and Open Class corps," Borland said. "There will be four $300 scholarships to World Class applicants and two $200 scholarships for Open Class applicants. As with last year, the results will be based both on need as well as merit." "We couldn't be more thrilled that this season we are in a position to expand and offer scholarships to participants of Open Class corps as well," Levine said. A panel of judges with cymbal-expertise will assess the submissions. The deadline for applications is Monday, April 15, and the winners will be announced at the beginning of May. 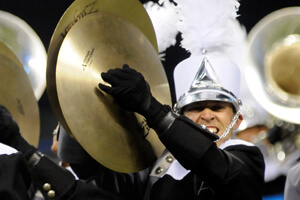 While a concise list of Open Class corps with cymbal lines in 2013 is still being compiled, the World Class corps fielding marching cymbals this summer include the Academy, Cascades, Colts, Crossmen, Jersey Surf, Mandarins, Oregon Crusaders, Pacific Crest, Pioneer, Santa Clara Vanguard and Spirit of Atlanta. That's exactly half of all competing World Class corps. "The growth we've experienced in the past year demonstrates that there are many people in the [marching arts] community who are passionate about cymbals," Levine explained. "Without their support via donations and purchases of the cymbal gloves, this scholarship opportunity simply wouldn't exist. We are continually thankful for all who show support, and we are looking forward to seeing this continue to grow in the future." Get additional info and the scholarship application at cymbalscholarship.com.